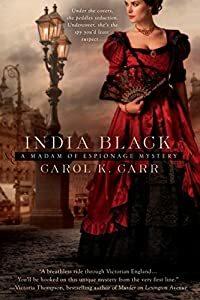 India Black by Carol K. Carr, a Mysterious Review. Review: After a member of the House of Lords dies in the arms of one of her "bints" — a briefcase he was carrying now missing — Madam India Black is hustled off to meet the British Prime Minister, who requests — she would say blackmails, as a more accurate term — her into retrieving it in India Black, the first mystery in this series by Carol K. Carr. Sir Archibald Latham was in possession of secret government documents when he expired. A Russian agent has made off with the case in which they were contained, but the British agents following him know that he hasn't opened it yet. That right belongs to Count Yusopov, who is currently in France but returning to London to be present a ball in his honor at the Russian embassy the following evening. Prime Minister Benjamin Disraeli himself — Dizzy to his friends … or maybe that's only how India thinks of him — is making the case for India to be involved, that she is uniquely qualified to retrieve the case while attending the gala event. And thus begins this delightful adventure of espionage, set in 1876. The narrative proceeds at a relaxed pace, but is fast-reading nonetheless. Credit India herself for keeping the reader entertained all the while, as she keeps the reader abreast of not only what's happening, but what she thinks of what's happening. During her introduction to the Prime Minister, she quickly realizes that she may be holding a winning hand, but may yet lose the game: "A whore learns early how to run a bluff. It comes in useful when you're haggling over the price or the services, or when the bloke you're with has turned nasty and you have to talk your way out of the situation. Which, come to think of it, was exactly what had just happened." Though India accepts the assignment — not that she had much choice — she looks at it as a business transaction. She can't help but note, however, that her handler, one Mr. French, is both charming and cunning, an irresistible combination. There's certainly more to this mysterious man than meets the eye … and he is one enigma that both intrigues her and frightens her … just a bit. India Black is a real treat, a most enjoyable mystery, deftly blending historical facts with a fictional story involving the titular character. It is not to be missed. Acknowledgment: Penguin Group provided a copy of India Black for this review.